Stop at the info booth to pick up a Corn Fest original souvenir, t-shirts, tanks, sweat shirts, hats and more! Don't forget your button! 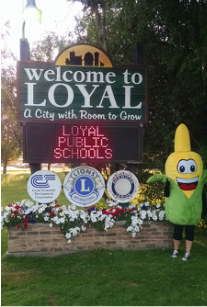 Cornfest Quest kick off at coronation. yoyoz.com for more details or check out the band! Sign up for Loyal Fire Departments bean bag tournament, in fire hall. 1:00 start time! Next to the corn shelter. If you don't have a team, that's OK, we will find one for you! Corn on the cob, all you care to eat, at the corn stand, (with button). For more event details click on the tab located on the left side of the website.